APGENCO JAO & JA Results Merit List 2018: APGENCO JAO Result 2018 | Check Junior Assistant Exam Merit List, Cut Off @ apgenco.gov.in Download Results of APGENCO Junior Assistant, Junior Accounts Officer JAO Exam Dated: 11-02-2018 APGENCO Junior Accounts Officer Recruitment results. APGENCO Result for Junior Accounts Officer & Junior Assistant Posts 2018. 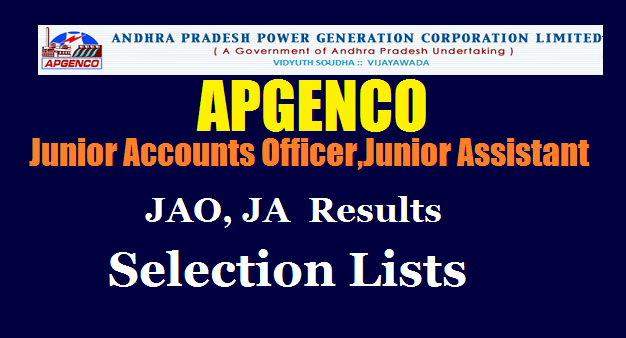 The Andhra Pradesh Power Generation Corporation Limited (APGENCO) announced the result for the post of Junior Accounts Officer & junior Assistant. Every year APGENCO invites candidates to fill various positions. APGENCO has declared the written test for the post of Junior Accounts Officer & junior Assistant and the exam will take place on 11th February 2018 the result released to date on 09th March 2018. Appeared candidates to check the result. For more details check its official website. Job Aspirants can follow below steps to check their results. The Andhra Pradesh Power Generation Corporation has announced APGENCO Junior Accounts Officer Recruitment notification for 51 vacancies. Therefore, here we are sharing complete details of the APGENCO JAO Recruitment Results, selection lists. APGENCO has released Result for the recruitment of Trainee Junior Assistant and Trainee Junior Accounts Officers. The written examination was held at Vijayawada only. Important dates & Result links for the APGENCO recruitment 2018 are given here. Organization Name: Andhra Pradesh Power Generation Corporation. Trainee Junior Accounts Officer (JAO): 22+4 (Backlog). Total Number of Posts: 51. Education Qualification: The candidates should possess the following qualifications as on 1st October 2017. Pass in IPCC/Intermediate examination of Institute of Chartered Accountants/Cost Accountants of India. Age Limit: Should not exceed 34 years. Written test will be conducted in the following manner. The candidate has to login to the website http:/ / www.apgenco.gov.in and click on APPLY ONLINE link or directly visit http: / /apgenco.cgg.gov.in to view detailed notification, user guide and to submit application form. Complete the registration process before the last date. Opening Date For Online Applications: 13th November 2017. Closing Date For Online Applications: 2nd December 2017. Online Application is accesible from 13.11.2017 to 02.12.2017.